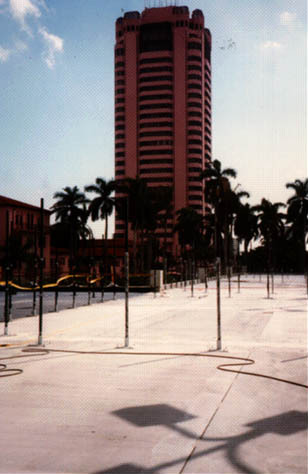 As part of the hotel’s giant expansion plans, Fluor Daniel built a 144,000 sq. ft. double tee parking structure with an elevated tennis court deck on top. The challenge was to find a seamless waterproofing membrane that was fast to install and tough enough to withstand the front-end loader tractor traffic used to distribute 7,000 tons of tennis court clay and sand onto the deck. After evaluating a number of preformed sheet-good products, cold-applied liquid membranes and other spray-applied systems, Fluor Daniel and Welch Tennis (the tennis court designer and equipment installer) selected EnviroLastic®. An independent waterproofing consultant confirmed that EnviroLastic® was fluid enough to cover the entire deck slab and properly flash some 700 fence brackets and other deck penetrations without any seams, yet tough enough to withstand the tractor wheel traffic and the abrasive grit of the sand and clay. To complete the installation of the waterproofing system, nearly 22,000 lineal feet of closed cell backer rod was installed between adjoining double tee flanges; about 800 lineal feet of 8” Sika Combiflex was installed over a 2” expansion joint; and 4,400 gallons of EnviroLastic® was installed over the deck and up the perimeter spandrel walls at approximately 30 +/- mils thick. Valet parking under the tennis court slab stays dry because of EnviroLastic®.